Mohanan Vaidyar met Honorable Chief Minister with the same motive as he met Mr. V. S, the ex-chief minister. Vaidyar made C M realize the side effects of iron tablets even if it is not attracted by magnet. Related to this, C M directed three officials to talk with Vaidyar. But they stood still on their stood still on their arguments. It leads to cancer or heart problems. It reduces the content of zinc in body. It reduces the immunity power. It leads to heart attack. The synthetic iron makes defects to the activity of our kidney, pancreas and heart. Taking medicine without knowing the correct reason will make the disease worsen. Many countries have applied these types of projects. But all those made inverse results. In Indonesia the growth of children were retarded. In Somalia, the deficiency of iron was corrected but they lost their immunity power. In India on 2013 feb, 61 students were hospitalized in Allahabad. This also raises a question against a common man’s fundamental right. We have the right to take food as we like and we have the right to take the treatment according to our choice. So, even if you have deficiency of iron in your body, don’t go behind allopathic medicines and find out the natural solutions, because the spinach, moringa, gooseberry, plantation flower all are treasury of iron. Note: there are two videos in this post. But due to some inconvenience we are not able to dub the second video. I.e. 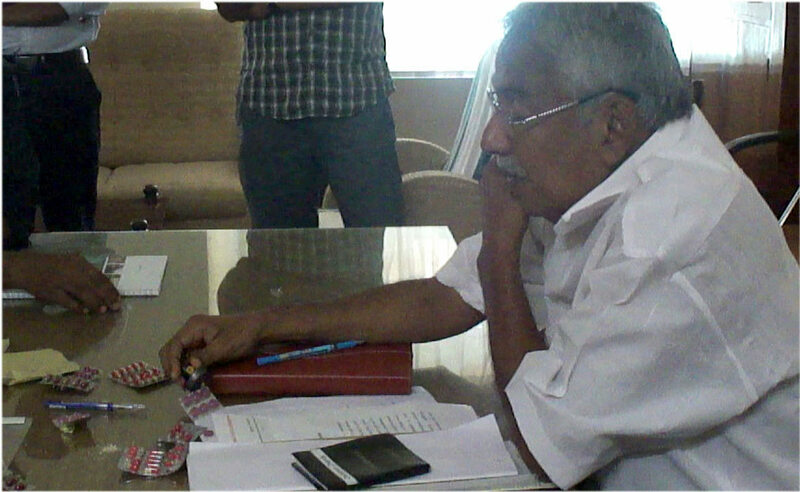 ; “Mohanan Vaidyar with NRHM officials about iron supplements going to be supplied in schools”. But we are really happy to give you a brief account of that conversation. Three officials came to meet Mohanan Vaidyar; Dr. Amar Fettle[State Nodal Officer (ARSH)], Dr.B Unnikrishnan (District Programme Manager) and Mr. P.K Harikrishnan [State Admisitrion Manager]. These people were sent by CM to talk about the iron supplements that are going to be distributed. Vaidyar told them the problems of talking iron tablets that contain real iron powder. But they refused it by saying that we are taking iron in different forms and some might attract magnet. They said that for many years government is giving iron tablets to the pregnant women and that is ferrous sulphate and there is no problem for them. So in this project also ferrous sulphate is going to be distributed in schools. Vaidyar showed them the proof of children hospitalized in different states because of this project. In Lucknow on February 14, 2013, 61 students were hospitalized and this report came on “Times Of India”. Then Vaidyar demonstrated the tablets attracted by the magnet and he told the after effects also. The officials showed the samples of their tablets that were not attracted by the magnet and they said that these tablets are going to be distributed. But they didn’t say anything about the iron tablets (that contains real iron powder) that are easily available in medical shops. These officials were not at all bothered about that. Many health problems will occur if a child already having high iron content takes the iron tablet. But the officials refused it by saying that there is no such condition in our body. They said that the iron content will always be normal in human body and if the iron content increases by taking the tablets, then it will be stored inside our body and will be taken after a day, a week or a month when it is needed. But I think every readers know that this is an utter non-sense, because there is such a condition in our body and that is known as “HEMOCHROMATOSIS”. Another thing is that only organic form of food is stored in body and taken when it is needed. These tablets are synthetic, not organic. Officials said that they want to improve the health condition of student. Then Vaidyar said an option to them. If they actually wanted to increase the health condition of students then they should supply that old “Cheena Chatti” or “Kadai” that is made of cast iron. It is sufficient to fill the decency of iron content in everyone’s body. Also spinach is another best option. There is no need of these tablets. Finally Vaidyar asked the officials a question. “Do you know the details of children died and hospitalized since 2009 because of this project made by central government?” They said ‘No’ and Vaidyar stopped the discussion with them. Readers, please try to find a natural solution for every health problems of you because synthetic will always harm you in a way or another. Previous: The Real Facts About Asafoetida, How they are cheating public? Next: അലോപ്പതി മരു‌ന്ന്‍ കഴിച്ചാലും ആയുര്‍വേദ മരു‌ന്ന്‍ കഴിക്കരുത്. എന്തുകൊണ്ട് ?